There are many urgent needs in these liberated lands: the infrastructure is dilapidated or destroyed, roads are missing or are not passable, children attend school in crumbling structures full of suffocating dust and mold. 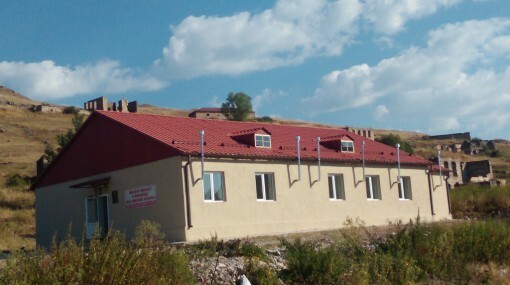 The reconstruction of the Lernahovit community school not only had an economical impact, but also provided a huge psychological boost to the residents. People who live in an isolated community, on land liberated thanks to the ultimate sacrifice of Armenian soldiers, saw that they are not ignored, that their children have both the opportunity and the right to study in a clean and modern school, in a “city school,” as characterized by the children of Lernahovit. The development of our liberated homeland – Kashatagh, Karvachar and other regions – is one of the cornerstones of a strong Armenian statehood. The liberated Kashatagh connects the Republics of Armenia and Artsakh and carries great importance for our motherland’s security: Kashatagh must continue to be resettled and rebuilt. Taking this into consideration, after completing the reconstruction of the Lernahovit school, the Hayrenaser Organization launches a new infrastructure project in another village of Kashatagh. During 2015 Hayrenaser plans to build a complex which will house essential infrastructure in the village of Vurgavan. The complex will include completely reconstructed school and a new gym. It will also house a new health clinic and new village administration, both of which have been non-existent in Vurgavan. Number of students in Vurgavan grows year by year and the current school building is unable to accommodate more students. ; therefore, the building will also be reconfigured to accommodate this growth. The current situation of the structure can be found here. By building essential infrastructure for the village we prevent emigration from Vurgavan, we give future and hope for tomorrow to the residents of the village. The school in the liberated lands is more than just an educational center. It has very important economical, social, cultural functions. The school provides many residents with jobs, which discourages emigration. Half-ruined and damp buildings are not enough for the resettlers: they need better conditions and they deserve them. The construction of this community infrastructure complex will give hope to the residents of Vurgavan. It will tell them that all Armenians are concerned with their problems, even if they live in an isolated village. Our heroes liberated Kashatagh, so we can preserve and develop it. Today, when after a-200-year hiatus the cries of Armenian newborns are heard in this piece of historic Armenian homeland, we ought to make these inhabitants feel strong and supported. So, let us develop our homeland and build an essential infrastructural complex in Vurgavan, which will give the residents a new school, new gym, new health clinic and new village administration. Vurgavan is a village in Kashatagh, situated about 40 km south of Berdzor. 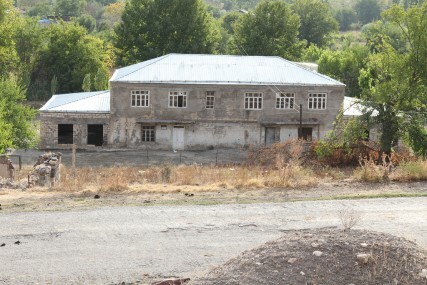 The village was liberated in 1993 during the Artsakh liberation war. Armenians started resettling in 1994. Currently, Vurgavan has 157 residents. Villagers are mainly engaged in agriculture.